When Is It Time for Gutter Replacement? Homeowners sometimes make the mistake of ignoring gutters in an attempt to save money. Unfortunately, fixing the problems caused by an inadequate gutter system is generally much costlier than the initial investment in quality gutter replacement! Properly designed and professionally installed gutters are crucial to your overall roofing system. Gutters have the important task of redirecting rain and snowmelt that flows off a roof. Without a gutter to collect the runoff, water would migrate to places where you simply do not want it to go, such as into the attic, down the walls, through basement openings and around the foundation. If you observe the following signs, they could be an indication that your gutter system needs to be repaired or replaced. Huff ‘N Puff provides experienced gutter replacement services for homeowners in Schenectady, Albany, Saratoga and Rensselaer counties and all nearby communities. 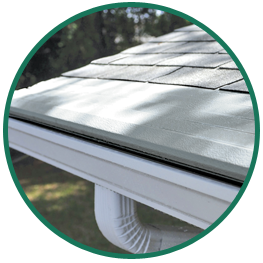 Our seamless gutters are made from the heaviest gauge aluminum available and formed on-site to ensure years of leak-free, trouble-free service. Huff ‘N Puff recommends the Gutter Helmet® system to protect every new gutter installation. In addition to preventing water damage caused by clogged gutters, Gutter Helmet is a beautiful complement to any home, with a sleek design in your choice of color to enhance the appearance of your roofline. The textured multi-layer PermaLife™ finish prevents all types of corrosion – including chalking, fading, saltwater and acid rain – and won’t crack, chip or peel. Huff ‘N Puff can provide a free inspection and estimate to evaluate the condition of your gutters and recommend the best solutions for your home. Complete our convenient online price quote request, or call us at (855) 483-3678 today to arrange a free, no-obligation estimate.